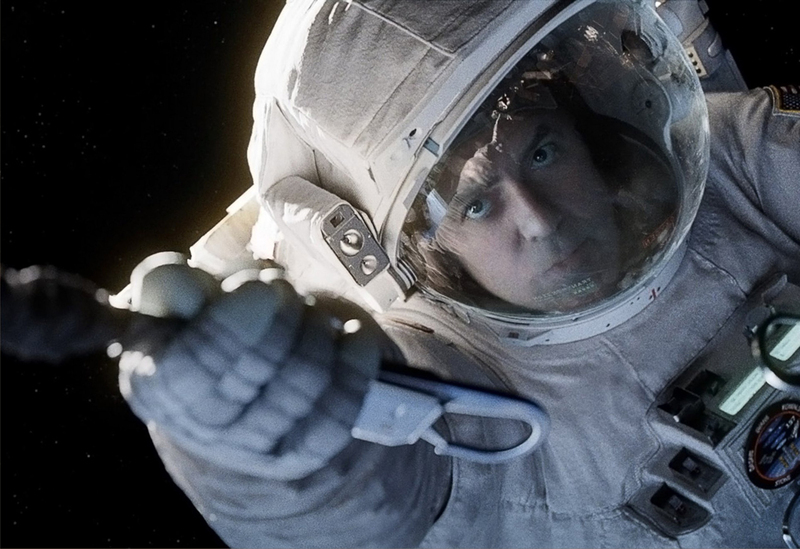 The film, "Gravity", makes two broad statements: Outer Space affords one magnificent visual beauty, and there is no place more dangerous in the ongoing quest of sustaining one's life force. Staying alive here on Earth, enveloped by our most hospitable atmosphere, is just one's plight to not do anything stupid. Orbiting our 'Little Blue Jewel' with temperatures as low as 146 degrees below zero, with no breathable oxygen, one must have a workable plan to stay alive. With NASA in charge of astronauts' structured existence, their very transitory ecosystem, they have an excellent opportunity to continue functioning as a life form. When all the good efforts of NASA go spontaneously awry, sustaining life in outer space becomes an effort of incredible proportions. One that can never have a happy ending for all, not without a good deal of luck, similar to the good fortunes of Apollo 13. The realty of the dangers of space travel has been all too real with the Apollo 1 disaster in 1967, then the twin Shuttle disasters: Challenger in 1986, and Discovery in 2003. In each disaster all on board perished. 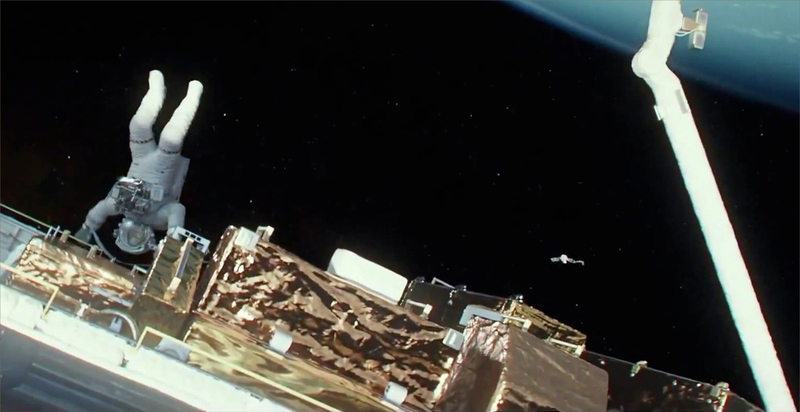 In this film, there is not so much luck either for the humans abroad in outer space. 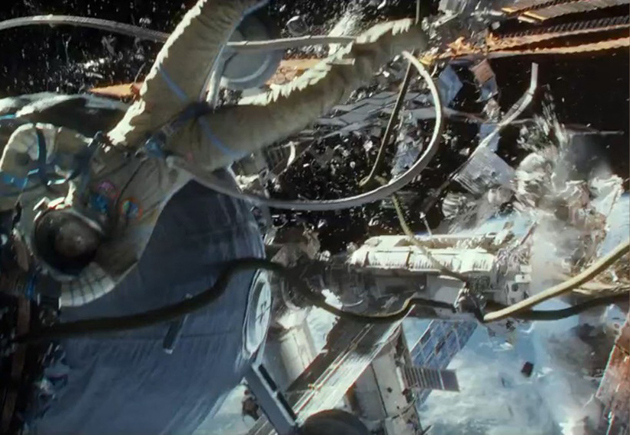 Director /Screenwriter Alfonso Cuarón's "Gravity" initially deals with another, one of the many, routine orbiting missions, where the prime objective, among multiple objectives, is to reconfigure and repair the essential Hubble telescope /imaging satellite. Near the conclusion of the astronauts' week plus mission, an unforeseen random event is put into motion whereupon the last day on the Explorer shuttle, these space participants know a second prime objective - stay alive. The Shuttle Explorer basking in Earth's grand beauty, while Explorer Captain Matt Kowalski, George Clooney, soaks it all in one last time: Above and then below. Click image to expand. 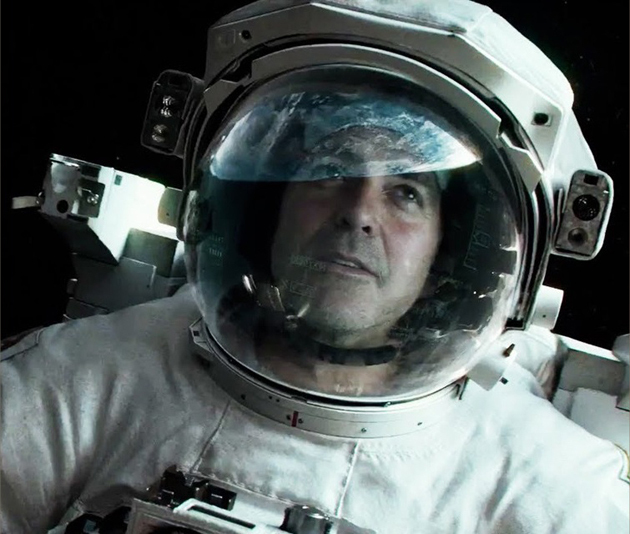 The film begins with the astronauts, especially the two we significantly meet: Researcher Ryan Stone, played by ECU Alum Sandra Bullock, and Explorer Captain Matt Kowalski, played by George Clooney. We meet Kowalski flying about with a prototype jet pack system strapped to his back, while trying to break the 'Space Walk' record, and Mission Specialist Stone tethered to the Hubble Telescope, which was her prescribed mission to correct the satellite, or enhance its capabilities. 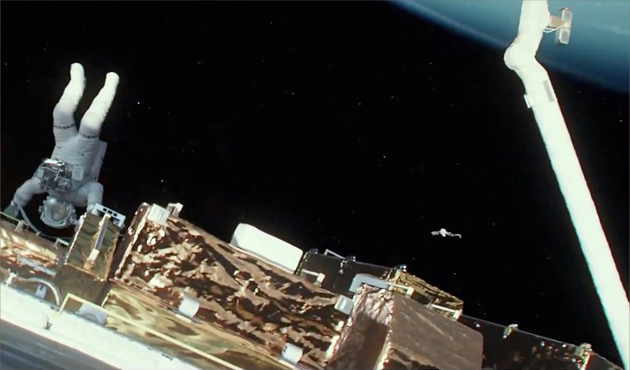 'Houston' (Mission Control), represented by the voice of Actor Ed Harris, is faintly corresponding with Mission Leader Kowalski, coming in clearer as Kowalski jets closer to the center of the action, the Shuttle Explorer. Mission Control: "Explorer, this is Houston." Dr. Ryan Stone: "Go ahead, Houston." 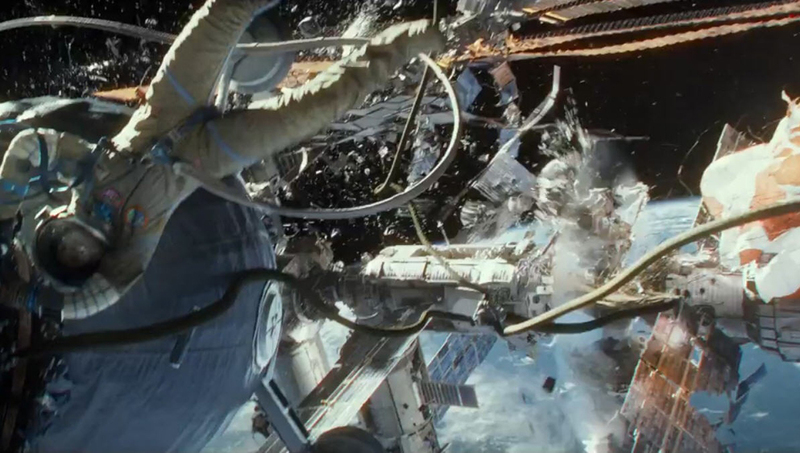 Matt Kowalski: "Explorer, this is Kowalski confirming visual contact with debris. Debris is from a BSE sat. 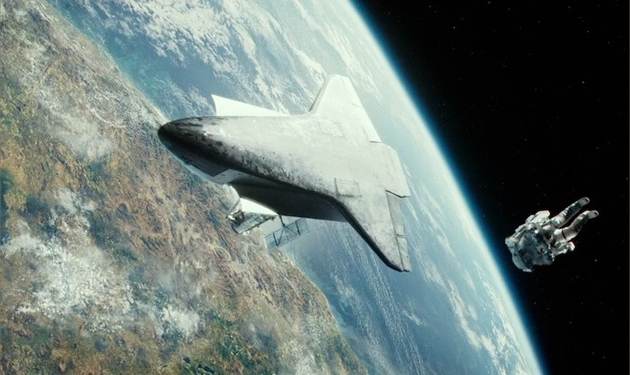 Repeat..."
Dr. Ryan Stone: "Dr. Stone requesting faster transport." Matt Kowalski: "We have to go. We have to go, go, go!" The Hubble Satellite attached to the Shuttle Explorer just before impact: Above. The Soyuz space station struck, damaged, but can the escape pod be made to fly? Below. Click image to expand. What had randomly transpired was that the Russians had arbitrarily fired an ICBM into one of its spy satellites, which sent its spreading debris field immediately hurtling through orbital space at a speed that was significantly faster than orbiting speed, which caused the debris to collide with other satellites in its orbital path. The intolerable presence of this destructive force here was two fold in its ominous danger: the debris field did grow, and continued at that excessive speed, as other satellites, many of them communication /transmission satellites, were torn to bits and absorbed by the debris field; the Shuttle Explorer was in the direct path of the expanded flying debris, and would continue to be so as the debris continued to travel at a speed that would commit its re-collision with anything within its expanding path every 90 minutes. Matt Kowalski: "Half of North America just lost their Facebook." 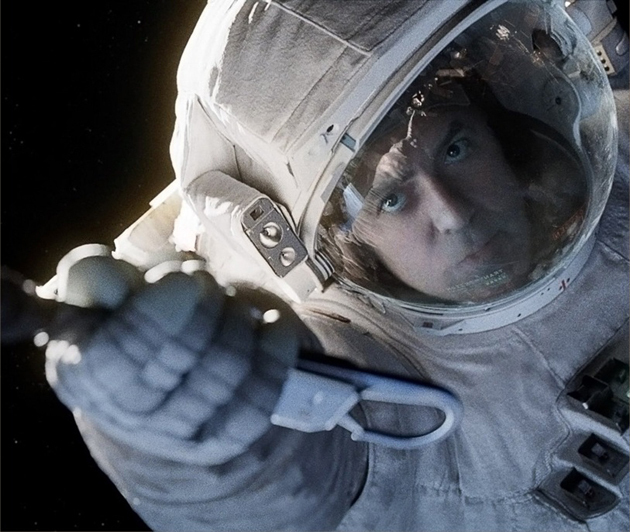 Explorer Captain Kowalsky, George Clooney, is at his tether's end just before the second orbital impact of the expanding debris field - this time upon Soyuz: Above and then below. Click image to expand. The Shuttle Explorer bore the worst of it, was rendered unworthy to use, and all of the crew, who we never actually meet, are lost. All that is left is Flight Captain Kowalsky and Mission Specialist Stone, and their continued existence was on tenterhooks. From here, the balance of this tight story was the supreme question of survival: Who lives and who dies? 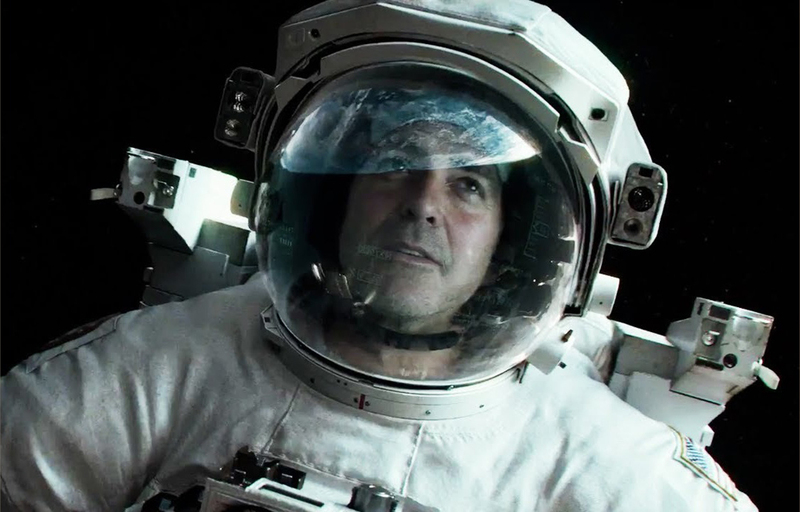 More than the outstanding, and rather captivating special effects of our world at a view from 354 miles up, the film's creator, Alfonso Cuarón, created a compelling story that made us care about it's main participants - Matt Kowalsky, George Clooney, and Ryan Stone, Sandra Bullock. The Director employed a spare 91 minutes - actually uses the tight programming as an efficient tool - to draw the audience in, capture their abject attention, and push us along for our collective bumpy, and most sympathetic ride until its fruition. 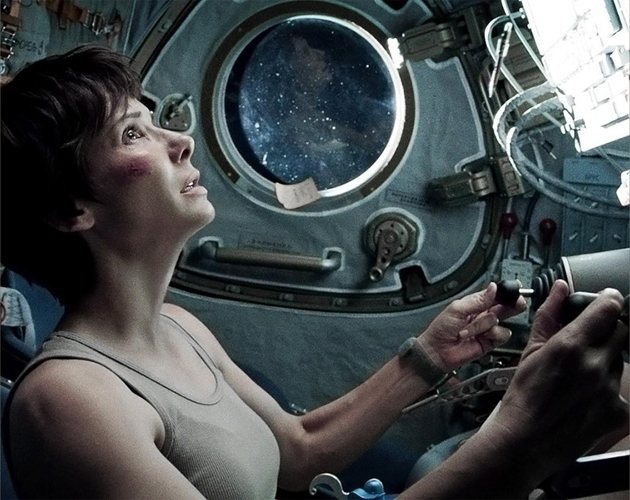 mission Specialist Stone, Sandra Bullock, in the escape pod of the proposed Chinese space station, Tiangong, which is not in space yet as of this post's publication: Above. Click image to expand. Upon this backdrop of profound Earthly beauty, we experience the immutable danger met, and we the audience, through the protagonists, embrace the challenge to survive, through their supreme efforts, their sacrifice and their heroism. We identify with their challenge, we embrace their struggle and we mourn the well presented storyline that one lives, one dies, but both are heroes to their very human core. By the grace of God and the skin of their teeth, one will endure the ordeal, which we cheer, as we also mourn the heroic efforts of the one that did not come home. 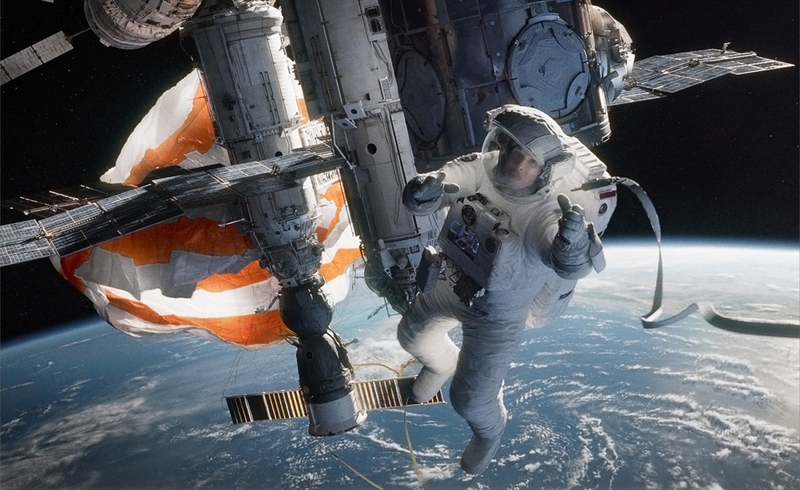 "Gravity" is a very good film. 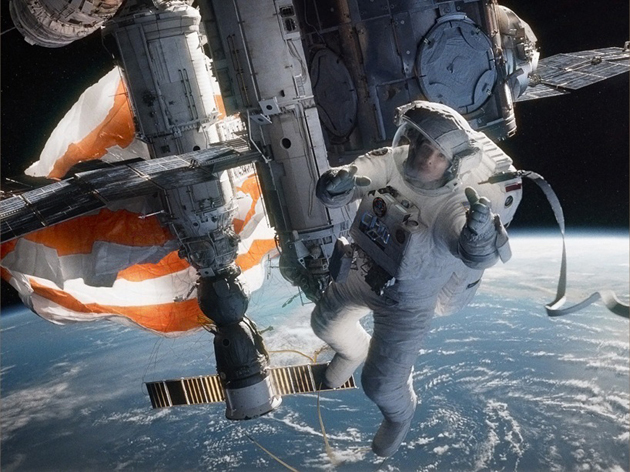 I watched it twice within a 24 hour period and loved it the second time as well (on the second viewing, I used the subtitles to catch every word of the communications between Mission Control and the astronauts, which helped with the story). It is a well acted story told well on a screen of dazzling special effects. It is definitely one of the five best films of the year. Soon, I hope to let you know of the other four films. Rated PG-13. Released on DVD February 25, 2014.